Is it time for pipe replacement at your home or business? Whether re-routing around a slab leak or copper repiping the entire building, our plumbing service experts do the job right for a permanent solution that sidesteps future problems once and for all. That’s important as with old pipes, improper materials, or poor installation you’re bound to have leaks sooner or later. And that puts you at risk of water damage, from mold to rotting wood and major structural damage. Replacement and repiping is complex and requires knowledge and skill many Phoenix-area plumbers lack. But our residential and commercial repiping service specialists are more than up to the task. We’ll explain your options and help you make the best choice for your budget. Then we’ll make sure everything goes smoothly. You might be surprised to know that most repipe projects only take a couple of days. The results may be unseen but are a greatly appreciated home improvement. And no more worries. ASAP Plumbing provides affordable repipe services to all Phoenix, Chandler, Gilbert, Arizona and surrounding areas. Schedule an appointment today. If you’re a bit confused about “repiping” it could be because the term can refer to a range of services. 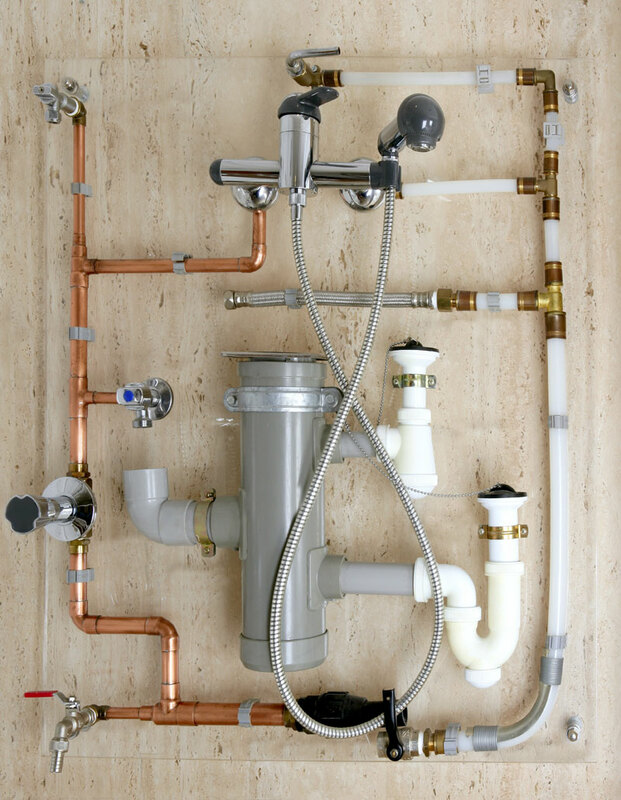 Replacing in-wall and under-floor plumbing for a single kitchen or bathroom fixture. This is usually economical only if the pipes are exposed in a crawlspace or basement. A partial replacement, limited to easily accessible pipes. Or perhaps only one or two runs that are in poor condition. It’s a limited-budget solution, appropriate only after a video inspection has verified the condition of other plumbing. Whole-house repiping is just that — the entire building. But in all cases, it involves removing old pipes and installing new ones. The replacement may be the same type of material, but considering the disruption and labor involved it’s typically worthwhile to upgrade to higher-quality piping for a longer trouble-free lifetime. For newer structures, the issue is usually a specific problem. In older buildings, the age and general condition of the plumbing are usually the deciding issues. Here are some of the factors we consider. Polybutylene pipes (typically blue or gray, but sometimes black) should be replaced. Used from the 1970s to mid-90s, it’s prone to leak, split, and burst. So plumbing codes no longer allow its use. Worst still, this type of plastic is damaged from the inside (primarily due to chlorine), so it may look just fine from the outside. At the very least, have it carefully inspected. Galvanized pipe is generally long-lasting, but is especially vulnerable to corrosion and is no longer used. It should be replaced at the first sign of leaks. Slab leaks are under flooring and several inches of concrete. Spot repairs are sometimes economical, but it’s often better to repipe the line along an alternate route. Leaking sewer lines made of clay, cast iron, or Orangeburg pipe should usually be replaced. An inspection that reveals corrosion or that unsuitable material was used. The heavy scale build-up has reduced flow. Without a water softener, this can become significant in as little as 10 years in the Phoenix area. Rusty-colored or metallic-tasting water indicates corrosion in the pipes or hot water heater. Kitchen & bathroom remodels that significantly change the location of fixtures will also need a residential repipe. Even total repipe projects typically don’t involve as much damage to walls and floors as most people think. Wherever possible we open up only small areas of walls under sinks and behind toilets and appliances. To avoid disturbing flooring we can re-route through attics or crawl spaces. And if you choose flexible PEX plumbing we can snake it along existing runs with even fewer and smaller openings. The main choice is between metal that is hard to install but more durable and various types of plastic that are less expensive. All permitted plastics have been thoroughly and extensively tested to have no adverse health effects. For hot and cold water lines, the main choices are copper and PEX. PEX — cross-linked polyethylene — is roughly 1/3 the cost of copper. It’s flexible, making it easy to install and freeze resistant. Its use results in far fewer joints and it simply doesn’t corrode. Lifetimes for premium products can be over 50 years if not exposed to direct sunlight. Also, in comparison to copper repiping, there’s reduced water noise and it’s 100% lead-free. ABS (a mixture of different plastics) has been approved for drain, sewer, and vent lines since the mid-1970s. CPVC (chlorinated polyvinyl chloride) is a long-lasting plastic approved in most areas for hot and cold water lines. HDPE (high-density polyethylene) is approved for use in many locations. PVC (polyvinyl chloride) is also long lasting, but with hot water, it’s vulnerable to cracking and releases toxins. It should never be used for drinking water lines but is sometimes chosen for drains and irrigation systems. Our company is fully licensed and insured as well as BBB Accredited. Our repiping services always comply with all fire and building code requirements, including the Uniform Plumbing Code. And we’ll take care of city or county permits and inspections. We use only quality materials and guarantee our workmanship 100%. We work with individual property owners, HOAs, property managers, and real estate companies. Respecting you and your property, we minimize disturbances. Our replumbing customers appreciate the results — better quality water, higher water pressure, and no more leaks.